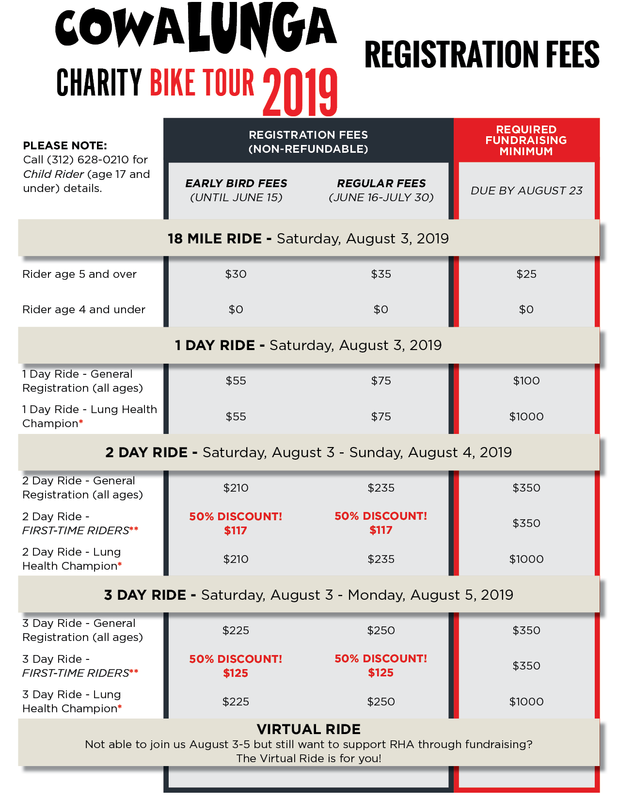 The chart below provides each route option’s early bird fees, regular registration fees and fundraising minimums in 2019. Please note that early bird fees will not be extended past June 15 with no exceptions. To download a PDF of this chart, click here. All CowaLUNGa fees and donations are non-refundable and non-transferable. Commit to raising a minimum of $1,000 and receive numerous coveted benefits including a custom commemorative CowaLUNGa Voler cycling jersey and an invitation to RHA’s Annual Recognition Night. Learn more about becoming a Lung Health Champion. To qualify for this discount, you must be a new rider and have never ridden the CowaLUNGa Charity Bike Tour before. Discount is only available for the Two Day and Three Day ride options and only applies to registration fees, fundraising is required. Offer expires June 15. To get a coupon code for this discount, call 312-628-0210 or email us. Have a conflict with CowaLUNGa 2019 or an injury that keeps you from riding? You don’t have to miss out on a year toward your Cow trophy and can still have an impact on RHA’s efforts to help people living with asthma, COPD, lung cancer and other lung diseases. Register as a Cow Virtual Rider! ▪ Early bird registration fees end June 15 at 5:00 p.m. There are no extensions or exceptions after that date. ▪ Team members must register three weeks in advance of the ride to be counted toward the CowaLUNGa Largest Team trophy. Team members may still register after that date but will not be considered in the trophy calculation. ▪ Online registration closes approximately 24 hours before the ride begins. After that time, call (312) 628-0210 to check availability as last minute cancellations may create open spots to participate. There is no day-of-event onsite registration. ▪ The fundraising deadline is August 23rd, 2019. All registered riders are required to fundraise, whether or not you are able complete the ride. Please note: if your fundraising minimum has not been met by the fundraising deadline, the credit card number provided at the time of registration will be charged any remaining balance to honor your commitment. If the credit card information is not current when we charge, you will be notified to provide a valid credit card number. Interested in experiencing CowaLUNGa but not able to ride? Join the CowaLUNGa volunteer crew. Ready to ride? Sign up for Cow emails. You’ll receive occasional event updates throughout the year and alerts when registration for the CowaLUNGa Charity Bike Tour opens. Still have questions? Visit CowaLUNGa FAQs or contact Gina Schwieger, Senior Director of Special Events, via email at [email protected] or call (312) 628-0210.